This entry was posted on Monday, October 31st, 2011 at 12:20 pm and is filed under General. You can follow any responses to this entry through the RSS 2.0 feed. Both comments and pings are currently closed. 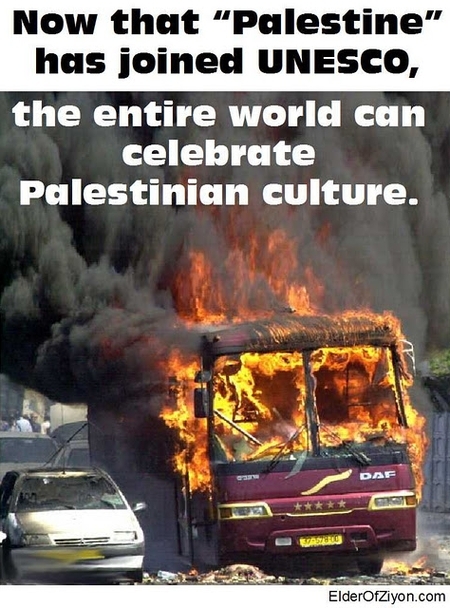 The Palestinian Arab contribution to world culture is especially notable in one area only, that of Terrorism. Certainly the Palestinians contributed much in the realm of airplane hijacking, suicide bombing, terrorizing civilian populations, hateful incitement to violence , creation of a a society totally dedicated to terror and destruction. These achievements are complemented by achievements in the realm of corruption, although in these area it is doubtful that the Palestinians are pioneers.